Old town 18km from the historic city of Aosta by road or directly lift-linked by an 18 minute gondola ride. Pila has undergone a great deal of expansion in recent years, thanks largely to its big ski area. Far above average ratio of chairs and gondola lifts to drags by European standards. Lively après ski. When will it snow in Pila? The next notable snow forecast for Pila is 1cm1in, expected on 24 April, with around 18cm7in forecast over the next 7 days. The Italian Ski Resort of Pila is part of the Aosta Valley ski area with access to 352km219 miles of downhill skiing, with 180 marked pistes, served by a total of 62 ski lifts. In addition to the skiing in Pila itself (70km43 miles of pisted ski runs), the appropriate ski Lift Pass will allow you to ski or snowboard in the other Aosta Valley ski resorts of Breuil-Cervinia, Courmayeur, Crévacol, Etroubles and Saint-Rhémy-en-Bosses. The ski resort itself is at 1,800m5,906ft, so skiing or boarding back to the resort is usually possible. With ski lifts as high as 2,750m9,022ft, skiing and snowboarding is assured throughout the season. Pila is an old town with a big vertical high in the Aosta Valley. It is one of the most snowsure destinations in the Alps, with the ski area running from 1765m – one of the highest resort bases on the continent, right up to more than 2,700m. Another unusual attraction is that the region’s historic capital, Aosta, 18km away by road is actually lift-linked directly by an 18 minute gondola ride giving an expanded choice of dining, shopping and sightseeing opportunities for anyone based in the ski resort. Pila is located on a natural balcony from which there are great views from Mont Blanc to Gran Paradiso and as far as Monte Rosa and the resort has a reputation for lively après ski. There is no need for cars once you arrive because you will find ski slopes and services right on your doorstep. The most difficult run is the 'Resselin'. Pila’s skiing offers the best of all worlds with skiing through woods of birch and larch in total safety and freedom on lower slopes and open powder snow areas above the treeline. Beginners and children have easy ski runs such as Baby Pila , Baby Gorraz and Grimod. The more advanced progress on to steeper slopes such as Leissé, Nouva which usually have excellent snow where you can turn and model curves endlessly, especially good news for carving enthusiasts in search of thrills and excitement. A run not to be missed is the Du Bois from the Chamolé chair lift. It's a unique experience skiing through aromatic birch woods and extraordinary snow first thing in the morning. For experts the Bellevue black run and Couis 1 are two tough runs, the latter a little easier than the former, with breathtaking panoramas over the nearby Cogne valley and the entire Monte Rosa range. For winter 2010-11 the resort opened a rare new black run this winter starting from Platta de Grevon (2700m) and descending to Plan De L’Eyve. Access to the run is provided by a conveyor lift which leaves from the Couis 1 arrival station. This new lift is housed within a perspex cover, forming a tunnel which is likely to be largely covered by snow through the winter for minimal visual impact, as well as protecting users from extremes of weather. The area where the new run is located is well positioned in terms of both slopes and snowfall and has been landscaped for a smooth descent and made secure from avalanche danger. The resort has also announced that to add to the enjoyment for those who like their snow light and fluffy, the new piste will be left ungroomed after each big snowfall – for several days at least, to provide an off piste experience. The snowpark is popular with boarders and freestylers, combining natural terrain gfeatures with created structures. There are jumps, slides and half pipe for those of all ages and experience. If you are already expert then the thrills of fun box, spine and the big jump await you. We don't currently have confirmed season dates for Pila. Usual opening is mid December, and usual closing is Mid April. NOTE:- Lift and Piste openings are always subject to Snow Conditions in Pila. Pila is able to make snow, on 8km5 miles of ski runs, with 400 snow cannons. The 13 ski lifts of Pila are able to uplift 16,300 skiers and snowboarders every hour. Pila is in the Italian Alps in Campo nell'Elba, Livorno, Italy. The nearest airports to Pila are Milan Malpensa, Milan Linate and Turin Caselle. There are seven airports within three hours drive. Pila can be lively at night when the right crowd are in town although it is often quiet during the week in low season. Gallaghers Irish Pub is one of the busier spots most nights and The Old English Distilary can throw great parties, with dancing on the table all night long given a good enough excuse (like St Patrick's Day). Want to Know when it Snows in Pila? 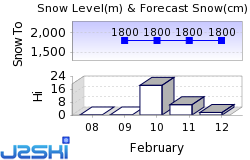 Click above to get Snow Reports by e-Mail for Pila. By doing so, you agree to Our Rules. Other Ski Areas within Aosta Valley. Other popular Ski Areas near Pila. For current snow conditions, see our Pila Snow Report. Want to ask about skiing and snowboarding in Pila? Or contact Pila Tourist Office. Note :- The information on J2Ski concerning Pila, where not clearly factual, is opinion only and is neither definitive or exhaustive. Warning :- Snow Sports are Dangerous! Skiing, snowboarding and all winter sports involve risk of serious injury or death. You MUST confirm all information, especially snow and weather conditions, in Pila before you ski or board. You participate at your own risk.